On the 29th (Sat), don't miss a visit to Rothschild Boulevard. Keep things going the next day: see the interesting displays at Yitzhak Rabin Center, see the interesting displays at Beit Hatfutsot - The Museum of the Jewish People, take an in-depth tour of Ben-Gurion House, then browse the exhibits of Independence Hall Museum, and finally take in the waterfront at Yarkon River and Park Hayarkon. Plan trip to Tel Aviv with our itinerary maker to find out where to go and what to do. Beijing, China to Tel Aviv is an approximately 12.5-hour flight. The time zone difference when traveling from Beijing to Tel Aviv is minus 6 hours. Traveling from Beijing in September, things will get a bit warmer in Tel Aviv: highs are around 35°C and lows about 28°C. Finish your sightseeing early on the 1st (Mon) to allow enough time to drive to Acre. Acre is a city in the northern coastal plain region of the Northern District, Israel at the northern extremity of Haifa Bay. On the 2nd (Tue), step into the grandiose world of Crusader Fortress, take in the architecture and atmosphere at International Center Mary of Nazareth, then explore the ancient world of Magdala, then contemplate the long history of Capharnaum the Town of Jesus, and finally take in the architecture and atmosphere at Church of Mount of Beatitudes. On the 3rd (Wed), you'll have a packed day of sightseeing: kick back and relax at Dado Beach, then get curious at Mada Tech - The Israel National Museum Of Science, then steep yourself in history at Stella Maris Lighthouse and Carmelite Monastery, and finally contemplate in the serene atmosphere at Bahai Gardens and Shrine. To find traveler tips, ratings, maps, and tourist information, you can read our Acre online vacation planner . Traveling by car from Tel Aviv to Acre takes 1.5 hours. Alternatively, you can take a train; or take a bus. In October, daytime highs in Acre are 32°C, while nighttime lows are 23°C. Finish your sightseeing early on the 3rd (Wed) so you can travel to Eilat. Kick off your visit on the 4th (Thu): take in breathtaking views at Red Canyon, enjoy the sand and surf at Princess Beach, and then identify plant and animal life at Coral Beach Nature Reserve. Get ready for a full day of sightseeing on the next day: admire the natural beauty at Botanical Garden Of Eilat, then kick back and relax at Dekel Beach Eilat, and then explore the fascinating landscape at Eilat Action. To see photos, where to stay, traveler tips, and more tourist information, use the Eilat driving holiday planner. Traveling by combination of train, bus, and flight from Acre to Eilat takes 3 hours. Alternatively, you can do a combination of train and flight; or take a bus. While traveling from Acre, expect a bit warmer days and about the same nights in Eilat, ranging from highs of 39°C to lows of 25°C. Finish up your sightseeing early on the 5th (Fri) so you can go by car to Mitspe Ramon. Kick off your visit on the 6th (Sat): explore the striking landscape of Avdat National Park, then delve into the distant past at Nabatean Avdat Acropolis, and then explore the engaging exhibits at The Alpaca Farm. To see reviews, traveler tips, more things to do, and tourist information, read our Mitspe Ramon holiday planner. You can drive from Eilat to Mitspe Ramon in 2.5 hours. Alternatively, you can take a bus. Traveling from Eilat in October, expect nights in Mitspe Ramon to be about the same, around 22°C, while days are a bit cooler, around 32°C. Finish your sightseeing early on the 6th (Sat) so you can drive to Ein Bokek. 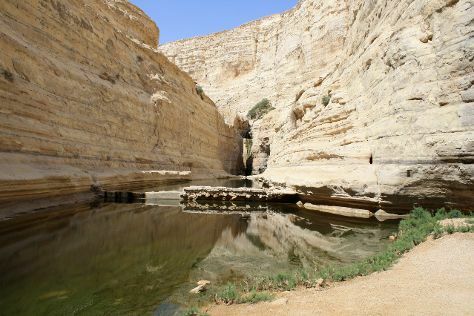 Kick off your visit on the 7th (Sun): tour the pleasant surroundings at Ein Bokek Beach, then get engrossed in the history at The Masada Museum, then look for all kinds of wild species at En Gedi Nature Reserve, and finally don't miss a visit to Nachal David Stream. To find more things to do, other places to visit, photos, and more tourist information, refer to the Ein Bokek online day trip planner . You can drive from Mitspe Ramon to Ein Bokek in 2 hours. Alternatively, you can take a bus. Wrap up your sightseeing on the 7th (Sun) to allow time to travel back home.